Seen here in the winner's circle with many others, University of Findlay junior Madison Hallas holds the blue ribbon she won in individual advanced western horsemanship at IHSA Nationals on May 6th. Hallas earned the Oilers' 21st individual western blue ribbon at Nationals since 2001. Two years earlier Hallas won another of those 21 ribbons in individual novice western. Raleigh, NC - Each of the six individual undergraduate western classes held at 2012 IHSA Nationals at the Hunt Horse Complex in Raleigh, North Carolina were made up of 12 riders. Each of these riders had to qualify for Regionals (by earning either 28 or 36 points in a division, depending on which division it was), place first or second at their Regional show and then place first through fourth at one of the three IHSA Semifinals held around the country March 24th and 25th. If one were to examine the list of riders who made it to Nationals in each of these six classes he or she would notice that the majority of riders to qualify came from schools which won their respective IHSA region. 16 of the 24 schools who won their region had at least one individual entered over these six classes. 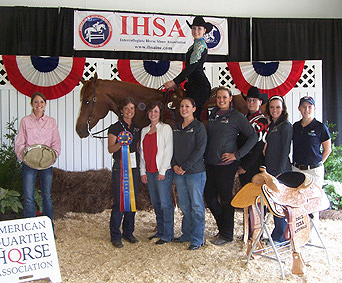 The University of Findlay had seven riders entered, the most for any IHSA western program. West Texas A & M University came close, with six. 46 of the 72 individual rides over six classes came from region champion teams. At least six riders in each of the six divisions came from a region-winning team. In total contrast 21 schools which were not region champions advanced 26 riders through the post-season rigors of Regionals and Semifinals to compete individually at Nationals over the final two days of the 2011-12 season. In most cases one single rider was all that made it from a particular school. These riders would be the lone voice for their programs, so hopefully these voices would be loud! Each rider who won a western class received a Tex Tan Saddle (on far right). Dustin Renken of the University of Nebraska at Lincoln (on horse) won two of them, as he prevailed in both individual novice western horsemanship and team advanced western horsemanship (on the same day!). For the second season in a row two full days of the IHSA National competition took place before any of the six individual western classes. Save for two western team classes and both rail phase classes of the AQHA High Point Open Western division the first two days of Nationals were hunter seat only. By the time the first individual class started, the Individual Reining division, only two hunter seat classes remained. As has been the case for over two decades, the National Reining Horse Association sponsors the IHSA's individual open reining class at IHSA Nationals. Riders who place fourth or higher in this particular division are invited to compete at the NRHA's "Derby" in Oklahoma City, Oklahoma at the end of June. The top four in the individual open reining join four riders selected by the NCEA/Varsity programs (the schools which do not compete in the IHSA but hope one day for official NCAA recognition) and four 'at large' riders selected by the NRHA. These twelve riders compete in Oklahoma City in the class known as the "Collegiate Reining Championship." Several IHSA-related riders have won this class in recent seasons so there is high drama when the combined reining scores are announced. This is the only class over the course of four days in Raleigh which can technically extend a rider's season beyond the final day of Nationals on May 6th. The individual reining took place on a very hot and muggy morning. One by one riders attempted the reining pattern. Five of the riders in the division not only finished with combined judge's scores in the 130's but were separated by only two points. Three riders received scores of '0' but apparently Blair Childress was the best of these three. The North Carolina State University junior from Kingland, Virginia was tenth in her IHSA Nationals debut. Also new to IHSA Nationals was Leah DiGioia of the State University of New York at Cobleskill (sophomore, from Higganum, Connecticut), who was ninth with a score of '123' from Judges Gretchen Mathes and Betsy Tuckey. It was not the IHSA Nationals debut of Purdue University senior Brooke Pence. However her Nationals debut had come one day earlier when Pence took part in the rail phase of the AQHA high point open rider division. From Danville, Indiana Pence was one of four riders in individual open reining who also was entered for the IHSA's top overall open western prize. Pence was eighth in individual open reining with a score of '132.5.' Another AQHA high point open entry was seventh. Shannon Leggett of St. Andrews University had to win a ride-off at Regionals versus Childress (they were tied atop the Zone 4, Region 3 western open rider standings when the regular season ended) to advance to Nationals as their region's top open rider. The senior from Charles City, Virginia who would go on to place second in the AQHA High Point received a score of '137.5.' Elizabeth Whitman of Oregon State University had more prior IHSA Nationals experience than any other western rider entered over the long weekend. Whitman had competed at each of the previous IHSA National shows and had competed in multiple classes at each of the past two. The senior from Albany, Oregon received a score of '138' for sixth place. Though anyone writing down the combined judge's scores could have figured out where most of the riders were going to place Whitman was one of two riders to receive a '138' score. The other was Alina Carter of Middle Tennessee State University, a junior from Dayton, Tennessee who was yet another rider making her Nationals debut. The tie at '138' was significant for if any of the top four riders opt out of the Derby the fifth place rider (in this case Carter) would be invited to go in his or her place. Ohio State senior Beth Bianco (on right) waits for teammate Austin Griffith (on left, who won three of four classes over the long weekend) to gather everyone else for a winner's circle photo after she was best in a field of 12 in individual open reining. The top four in individual open reining advanced to the NRHA Derby's Collegiate Championship Class in Oklahoma City in late June, including IHSA Reining Champ Bianco. Tobie Montelbano of Texas Tech University was fortunate to be a half point better than Carter and Whitman. The junior from Gilmer, Texas received a score of '138.5' which made him the first of four riders Derby-bound to hear his name announced. It had been three years since Catherine Howland had competed in the individual open reining. The Morrisville State College senior from Rutland, Vermont had been tenth in the division at 2009 Nationals in Murfreesboro, Tennessee. A three-time participant in the AQHA high point open western division, Howland was third with a score of '139.5' to advance to the Derby for her one and only time. Josh Clevenger of Black Hawk College was the only freshman out of 12 entries. From Mount Olive, Illinois Clevenger had fired up the crowd with his score of '140.5' which turned out to be Reserve Champion-worthy. Because each rider left the ring one by one after receiving their ribbon only one rider remained. That rider was Ohio State University senior Beth Bianco. From Wadsworth, Ohio Bianco received a score of '143' to clearly best the rest of the field. It was Bianco's first time entered at an IHSA Nationals event. Bianco had been caught in a logjam at Ohio State as the Buckeyes often boast some of the best open riders of any IHSA program every season. When Bianco was a freshman then-senior Buckeye teammate Keith Ceddia won this division in Murfreesboro. This season teammate Austin Griffith competed in every open western division at IHSA Nationals except this one. Last season teammate Jesse Gentile didn't qualify for Nationals but was invited to the Derby as an at large entry. Gentile defeated all eleven others in Oklahoma City last summer so Bianco will be trying to make it two wins in a row at the Derby for Ohio State reiners. Between the conclusion of the individual open reining and the start of the Individual Open Western Horsemanship later in the day three other classes, several awards presentations, the annual parade of teams and a severe thunderstorm took place. The thunderstorm helped in many ways as the hot and humid conditions which dominated the entire national show to this point were finally gone (at least for the rest of this day). Howland, Carter and Whitman were back from the individual open reining to see if they could improve on their ribbons earlier in the day. As would be the case in all but one of the remaining individual western classes, riders entered the ring at a walk and then were asked to jog and later to lope. After judges Mathes and Tuckey had seen all 12 riders move at the various gaits everyone was asked to line up and ride the pattern. Riders then steared their horses around the cones set up in the ring. After all 12 riders had completed the pattern they were asked to dismount, horse handlers entered the ring to remove the horses and the ribbons were presented. After two riders were thanked as honorable mentions, tenth place in open rail went to Brice Howell of Black Hawk College. Because Black Hawk is a two-year school this would likely be Howell's final ride for Black Hawk. However like many of his teammates the sophomore from Greentown, Indiana could continue his education at a four-year school (several recent Black Hawk graduates, including 2011 AQHA high point open western champion Bekah Irish, were entered for other schools at 2012 Nationals). Ninth place went to Sunni Hecht of Rocky Mountain College. A freshman from Lewistown, Montana, Hecht was one of only two riders in this class whose team did not win a region title in 2011-12. 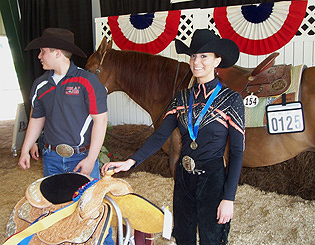 Taylor Duncanson was the only Centenary College western rider to compete at 2012 Nationals. The junior from Raymond, Maine has been part of back-to-back Centenary region championships, the first time the Hackettstown, New Jersey school's western team has accomplished this feat. Duncanson was eighth while Carter slipped a couple of placings to seventh. Though Oswego State University (also known as the State University of New York at Oswego) did not have a full team at Nationals the Lakers had several individuals qualfied, including Alekz Huttemann-Kall. The senior from Watertown, New York was the Zone 2, Region 2 AQHA high point open western representative, and she was sixth in individual open western for her best ribbon of the weekend. Howland slipped two places to fifth while Addie Davis of West Texas A & M was fourth. A senior from Vashon Island, Washington this was Davis's first-ever ride at an IHSA Nationals event. Whitman was third, earning what was her highest ribbon over the course of three days. The rider in second place just missed winning four classes at 2012 Nationals. Austin Griffith of Ohio State University won both team open classes for the Buckeye's western team while also capturing the AQHA High Point Open Western championship as the IHSA's top western open rider for the 2011-12 season. However the sophomore from Dublin, Ohio finished one place behind Ashley Frappier here. A senior from Farmington, Massachusetts, Frappier was the first of seven University of Findlay riders to show in an individual western class. Frappier had worked her way up to the open level, having started in the novice western level several seasons ago. Though Findlay boasts such great open riders as Jarrod Bush and former Black Hawk star Irish it was Frappier who survived both rounds of playoffs and then was best among the 12 survivors. 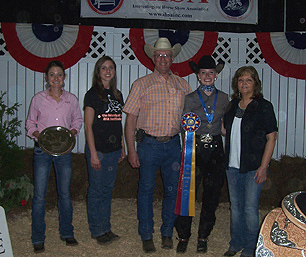 University of Findlay senior Ashley Frappier (holding blue ribbon) stands between Oilers coaches Cindy Morehead (on far right) and Clark Bradley after she won individual open western horsemanship on May 5th. Frappier was the only rider to defeat Ohio State's Austin Griffith in his four 2012 IHSA Nationals classes. The remaining four individual western classes were bunched together on Sunday, May 6th, the final day of 2012 Nationals. Following two western team classes and half of the reining phase of the AQHA high point open western was the Individual Advanced Western Horsemanship division. Half the riders in the division came from teams which did not win their respective regions and four of these riders would place inside the top ten. After announcer Kenn Marash gave out two honorable mentions tenth place went to Alissa Frederick. From West Chicago, Illinois Frederick was one of many Black Hawk College sophomores to place inside the top ten individually over the weekend. North Dakota State University captured their first-ever western region title in 2011-12 and Hannah Beyer was one of two Bison to compete at Nationals. A junior from Rapid City, South Dakota, Beyer was ninth. Brandon Essink, a University of Nebraska at Lincoln senior from Syracuse, Nebraska closed out his IHSA undergraduate era with an eighth. Essink would not be the only Cornhusker to place top ten on this day. Though the University of Tennessee at Knoxville has fielded an IHSA program since the 20th century Kimberly King made history when she became the first Volunteer western rider ever to advance to IHSA Nationals on March 24th. A senior from Greenback, Tennessee, King received one of the louder cheers when she was announced as seventh place. While the University of Tennessee at Knoxville had never sent a western rider to IHSA Nationals, Central Washington University may have never sent a rider of any kind to Nationals prior to Shannon Bedell. A junior from Touchet, Washington Bedell finished third to King's fourth at the Ocala, Florida Semifinal and went on to place sixth for the Wildcats in Raleigh. Kaitlyn LeBlanc was the first of two University of Findlay riders to hear her name called. The sophomore from Hartley, Delaware (who was recruited by the University of Delaware Soccer Team!) was fifth. Yet another rider set a first for her school's IHSA program. Lesley Hammontree is the first-ever Western Carolina University rider to compete at IHSA Nationals. Ironically the Catamounts' hunter seat team has been around better than twice as long as their western. In any event Hammontree survived the Harrington, Delaware semifinal to reach Raleigh where the freshman from Onondaga, Michigan was fourth. Morgan Parisek of Murray State University was third. The sophomore from Elgin, Illinois was one of only two riders to place as high as third in a western individual class not from a region champion team. Julia Roberts (no, not the academy award-winning actress) of West Texas A & M was the Reserve Champion. A sophomore from Clovis, New Mexico, Roberts would nearly duplice her second place ribbon later in the day when she was third in the more-difficult team open western horsemanship. The only rider remaining was Madison Hallas of the University of Findlay. A junior from West Nyack, New York, Hallas was already familiar with the winner's circle. At 2010 Nationals in Lexington, Kentucky Hallas won the individual novice western horsemanship. Hallas also competed at both 2010 and 2011 Nationals in team advanced western each time. Hallas and Frappier continued a remarkable streak for the Oilers: Since 2001 Nationals in Conyers, Georgia at least one University of Findlay rider has won an individual open western division at the IHSA's year-end show every single season. Individual Intermediate Western Horsemanship immediately followed the advanced class. The University of Findlay was trying for the record books in this one, as no school has ever produced winners in the same individual division - english or western - for five straight seasons at IHSA Nationals. Heather Allenby (2008), Spencer Zimmerman (2009), Ashley Wolf (2010) and Melissa McDonald (2011) had each won individual intermediate at Nationals for the Oilers. However tenth place went to Abbie Bates of Findlay, the freshman from Michigan being the only Oilers entry in the class. Sarah New was the first of two St. Mary of the Woods College riders to compete individually on this day, the freshman from Greencastle, Indiana placing ninth. Jordan Roberts was the only Ohio University - Southern Campus entry at 2012 Nationals. A junior from Wapakoweta, Ohio, Roberts was eighth. Morgan Carey was the second of two Albion College riders to compete individually at 2012 Nationals and the first to earn a top ten ribbon. The freshman from Hemlock, Michigan was seventh. The University of Wyoming had but one rider at 2012 Nationals. Adeline Andree, a senior from Vail, Colorado was sixth representing the Cowgirls. Just as Findlay had two riders in the previous class West Texas A & M had two riders in intermediate western. And just as the first of two Findlay riders was fifth so was Paige Frevert of the Buffs. A junior from Glassford, Illinois, Frevert repeated her fifth place ribbon in team novice western two days earlier. Frevert is an example of a Black Hawk rider with a two-year degree who continued riding in IHSA competition at another school. Ironically Frevert's former teammate Renee Blacker finished one place ahead of her here. A sophomore from Montecello, Illinois, Blacker was fourth for Black Hawk. Slippery Rock University had never sent a western rider to Nationals before Shanna Lengner was second in Harrington on March 25th (between Blacker, who won and Roberts). A Junior from Lake Ariel, Pennsylvania, Lengner tied Murray State's Parisek as the rider with the top individual western ribbon which had not come from a region champion. Lengner was third while Emily Kopko of Middle Tennessee State University was the Reserve Champion. A sophomore from Franklin, Tennessee, Kopko would not be the last of the Blue Raiders to earn a top-two ribbon on this day. Just as Findlay riders were first and fifth in the previous class, West Texas A & M riders were first and fifth here. Audra Head, a senior from Lubbock, Texas won the intermediate western for the Buffs. It was Head's first ride at IHSA Nationals. Head is the first West Texas A & M rider to win an individual class at Nationals since Errolynne Franck won the 2008 advanced western class in Burbank, California. Go to the Head of the class! West Texas A & M senior Audra Head (on horse) poses with Buffs Head Coach Amanda Ricketson (until recently known as Amanda Love, holding the blue ribbon) and many of her teammates after winning individual intermediate western horsemanship. 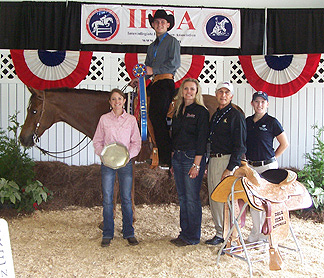 The young lady holding the circular trophy on the far left is Krissy Mailman of the American Quarter Horse Association. 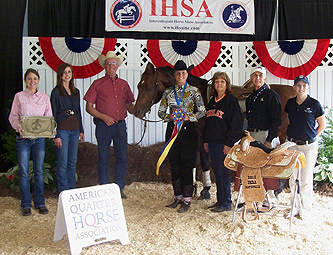 Mailman found her way into most of the winner's circle photos and quite rightly, for the AQHA and the IHSA have been partners since the 1980's. Following the second Reining Phase section of the AQHA high point open rider and the awards presentation for that division (awarded to Griffith) the third-to-last class of 2012 IHSA Nationals took place. Individual Beginner Western Horsemanship is nearly the same as all the other horsemanship classes. The only difference is that at no time do the riders lope. Three schools (Oregon State, Oswego State and West Texas A & M) had two riders each in beginner western. After two riders received honorable mention tenth place Leslie Ulm of Truman State University. A sophomore from Urbandale, Iowa, Ulm was the Bulldog's only western rider entered at 2012 Nationals. Lindsey McNeill was certainly not West Texas A & M's only rider. The Buffs sophomore from Houston, Texas was ninth. Oregon State riders heard their names called out back-to-back. Stephanie Borgen (junior, from Woodburn, Oregon) was eighth while Lauren Welch (senior, Omaha, Nebraska) was seventh for the Beavers. Nick Duncan of the University of Findlay was sixth. Considering that beginner is the entry level it was a tad surprising that Duncan was the only freshman out of 12 riders entered. Brent Rose of Oswego won the division at the Harrington, Delaware semifinal. This time the junior from Kenoza Lake, New York was fifth. Tiffani Bennethum of Bowling Green State University proved to be very consistant over her final two shows. The senior from Dalton, Ohio was fourth at the Findlay, Ohio semifinal and was fourth again on May 6th. Bennethum became part of an Oswego "sandwich" when Oswego's Brianna Brogan was awarded third place. A junior from Lockport, New York, Brogan was second to teammate Rose at Semfinals. Third at the Harrington semi behind both Rose and Brogan was Amber Powell of St. Andrews University. A senior coincidentally from Laurinburg, North Carolina (where St. Andrews University is located), Powell placed higher at Nationals, earning the reserve championship. Considering that West Texas A & M had waited four years for an individual win and that the Buffs had all of four individual western champions at all previous IHSA Nationals combined it was surprising to some that the Buffs produced back-to-back winners. Jessica Read, a senior from San Diego, California won her first and only IHSA Nationals class for the Buffs (or Buffaloes if you prefer). Read was also the only California resident to win a western class in Raleigh. Though it was not the final class of 2012 Nationals, Individual Novice Western Horsemanship was the last of six individual classes. Held between individual beginner and team open western, individual novice has the least amount of history, as the division was only added prior to the 2003-04 season (there were only five IHSA western divisions for nearly 20 years before). Today's winner would be the ninth person ever to win individual novice at Nationals. Five of the eight previous winners were Findlay riders (including Hallas). The Oilers had two riders entered. Could they make it six wins in nine tries? Read all about it! West Texas A & M riders won back-to-back individual classes as Jessica Read of the Buffs (on horse) won individual beginner western. Joining Ricketson and Mailman in the photo is IHSA Founder And Executive Director Bob Cacchione (second on right) and an unidentified IHSA Nationals volunteer who was in charge of escorting Read to the trophy room to pick up prizes, write out thank-you notes and let people know where to send her saddle! The process was the same as usual: Enter ring, ride at the walk, jog and lope, line up, perform the pattern, dismount and wait for Marash to announce the placings. One of the two riders announced as honorable mention was Findlay sophomore Emma Bates while tenth place went to Jared Deatrick (sophomore, Paulding, Ohio) also of the Oilers. Ninth place went to Rebecca Cochran of Berry College. A sophomore from Portsmouth, Rhode Island, Cochran was surprisingly the defending National Champions' only individual western undergradate qualifier. Catherine Jula of West Virginia University was similarly the only Mountaineer to qualify individually (though like Berry, West Virginia did have a rider entered in the AQHA high point open rider competition). A freshman from Blacklick, Ohio, Jula was eighth. In fact three riders in a row were the only individual western undergraduate qualifiers from their respective schools as Caroline Lavenduski was seventh. A University of Delaware junior from Newtown, Pennsylvania, Lavenduski was seventh for the Zone 3, Region 2/Zone 4, Region 4 champion Fighting Hens. To the best of our knowledge Rebecca Folk is the first-ever Lafayette College western rider to qualify for IHSA Nationals. A junior from Kutztown, Pennsylvania, Folk was sixth. Though 2007 University of Kentucky graduate Megan Carter won the alumni reining one night earlier Kevin Sipes was the only undergraduate Wildcat entered in the western classes. A senior from Lexington, Ohio, Sipes was fifth. Karen Cannon of St. Mary of the Woods finished four places higher than teammate New as the sophomore from Manassas, Virginia was fourth. The final Oswego rider of the 2011-12 season to hear her name called was Samantha Kirby. A sophomore from Albion, New York, Kirby was third to tie Brogan for the Lakers' best ribbon in Raleigh. For the second time on this day a MTSU Blue Raider was Reserve Champion. Had Cayce Turner won the division the junior from Cookeville, Tennessee would have been the second Middle Tennessee State rider ever to win individual novice western at Nationals. Instead Turner equaled teammate Kopko. The winner of the division started the day the way he ended it. Dustin Renken, a University of Nebraska at Lincoln won team advanced western seven classes earlier. A sophomore from Bertrand, Nebraska, Renken ignited a Cornhusker's rally as he and Blake Preston won team classes to lift Nebraska from also-ran single digits to within striking distance of a National Title going into the team open rail class at the end of the day. Renken, Read, Head, Hallas, Frappier and Bianco not only came from teams which won their respective regions, each competed for a school with a full western team in the team competition. In 2011 the numbers were actually even more skewed towards schools whose teams won region titles, with 52 of the 72 rides going to those who competed for the top teams in their respective regions. Perhaps this goes to show that if you want to make it through the rigors of Regionals and Semifinals your best chances are with the teams which are the strongest throughout the regular season. If you compete for a school that clearly is not headed to any of the 2013 Semifinals events with a full western team it would be wise to step up practices in preparation for the post-season if one aspires to compete in an individual western class in Harrisburg, Pennsylvania next May. (Addendum: On June 30th several IHSA-related riders took part in the Collegiate Reining Championahip at the NRHA Derby in Oklahoma City, Oklahoma. Though Catherine Howland of Morrisville State College qualified with a third in the NRHA individual open reining on May 5th she did not compete n Oklahoma City. 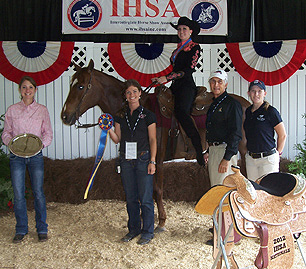 Alina Carter of MTSU, the fifth place rider at IHSA Nationals, took Howland's place. Austin Griffith of Ohio State was one of the NRHA's at-large selections. Griffith's former Ohio State teammate Jesse Gentile, who won the 2011 Collegiate Reining Championship but who did not compete for the Buckeyes in 2011-12, was also selected. The IHSA-related riders did not have one of their better years in the Collegiate Reining class of 12. Texas Tech's Tobie Montelbano earned the best ribbon of any IHSA rider, placing fourth at the Derby. Gentile was fifth while Josh Clevenger, who was reserve champion on May 5th, was seventh. Griffith was tenth, May 5th winner Beth Bianco of Ohio State was eleventh while Carter was 12. Jenna Blumer of Oklahoma State University won the Collegiate Reining Championship. A sophomore from Spring Brook, Pennsylvania, Blumer finished one place ahead of the University of Georgia's Lauren Tieche for the blue ribbon. By coincidence each of the six NCEA-related riders came 'in pairs' from schools. Blumer and Cowgirl teammate Caroline Daniels (ninth place) both participated. Tieche and Bulldog teammate McKenzie Lantz (sixth place) were both entered and Auburn teammates Stephanie Rucci (third) and Indy Roper (eighth) rounded out the group of riders who competed in the 2012 Collegiate Reining Championships). The following is a list of the Individual Western Class-by-Class Results from 2012 IHSA Nationals, held at the Hunt Horse Complex in Raleigh, North Carolina. The first two classes listed were held Saturday, May 5th while the final four classes were held on Sunday, May 6th. The Judges for all western classes were Gretchen Mathes and Betsy Tuckey. National Reining Horse Association Individual Open Reining Pattern: 1. Beth Bianco, Ohio State University. 2. Josh Clevenger, Black Hawk College. 3. Catherine Howland, Morrisville State College. 4. Tobie Montelbano, Texas Tech University. 5. Alina Carter, Middle Tennessee State University. 6. Elizabeth Whitman, Oregon State University. 7. Shannon Leggett, St. Andrews University. 8. Brooke Pence, Purdue University. 9. Leah DiGioia, State University of New York at Cobleskill. 10. Blair Childress, North Carolina State University. Individual Open Western Horsemanship: 1. Ashley Frappier, University of Findlay. 2. Austin Griffith, Ohio State University. 3. Elizabeth Whitman, Oregon State University. 4. Addie Davis, West Texas A & M University. 5. Catherine Howland, Morrisville State College. 6. Alekz Huttemann-Kall, State University of New York at Oswego. 7. Alina Carter, Middle Tennessee State University. 8. Taylor Duncanson, Centenary College. 9. Sunni Hecht, Rocky Mountain College. 10. Brice Howell, Black Hawk College. Individual Advanced Western Horsemanship: 1. Madison Hallas, University of Findlay. 2. Julia Roberts, West Texas A & M University. 3. Morgan Parisek, Murray State University. 4. Lesley Hammontree, Western Carolina University. 5. Kaitlin LeBlanc, University of Findlay. 6. Shannon Bedell, Central Washington University. 7. Kimberly King, University of Tennessee at Knoxville. 8. Brandon Essink, University of Nebraska at Lincoln. 9. Hannah Beyer, North Dakota State University. 10. Alissa Frederick, Black Hawk College. Individual Intermediate Western Horsemanship: 1. Audra Head, West Texas A & M University. 2. Emily Kopko, Middle Tennessee State University. 3. Shanna Lengner, Slippery Rock University. 4. Renee Blacker, Black Hawk College. 5. Paige Frevert, West Texas A & M University. 6. Adeline Andree, University of Wyoming. 7. Morgan Carey, Albion College. 8. Jordan Roberts, Ohio University - Southern Campus. 9. Sarah New, St. Mary of the Woods College. 10. Abbie Bates, University of Findlay. Individual Beginner Western Horsemanship: 1. Jessica Read. West Texas A & M University. 2. Amber Powell, St. Andrews University. 3. Brianna Brogan, State University of New York at Oswego. 4. Tiffani Bennethum, Bowling Green State University. 5. Brent Rose, State University of New York at Oswego. 6. Nick Duncan, University of Findlay. 7. Lauren Welch, Oregon State University. 8. Stephanie Borgen, Oregon State University. 9. Lindsey McNeill, West Texas A & M University. 10. Leslie Ulm, Truman State University. Individual Novice Western Horsemanship: 1. Dustin Renken, University of Nebraska at Lincoln. 2. Cayce Turner, Middle Tennessee State University. 3. Samantha Kirby, State University of New York at Oswego. 4. Karen Cannon, St. Mary of the Woods College. 5. Kevin Sipes, University of Kentucky. 6. Rebecca Folk, Lafayette College. 7. Caroline Lavenduski, University of Delaware. 8. Catherine Jula, West Virginia University. 9. Rebecca Cochran, Berry College. 10. Jared Deatrick, University of Findlay.